The addition of a targeted agent to definitive chemoradiation failed to improve survival in an unselected population with esophageal cancer, a randomized trial showed. In fact, patients who received cetuximab (Erbitux) with chemoradiation had significantly worse overall survival (OS) reflected in a 50% increase in the hazard versus chemoradiation alone, reported Thomas Crosby, MD, of Velindre Hospital in Cardiff, Wales, and colleagues. Investigators could not find any subgroup of patients who benefited from cetuximab, they said in a presentation at the Gastrointestinal Cancers Symposium. “The addition of cetuximab cannot be recommended to standard definitive chemoradiotherapy in the treatment of unselected patients with esophageal cancer,” Crosby said. “The use of high-quality definitive chemoradiotherapy in the treatment of localized, poor-prognosis esophageal cancer was associated with excellent survival compared with previous radiotherapy and surgical series,” he added. Randomized trials have shown that definitive (or primary) chemoradiation improves survival in localized esophageal cancer compared with a single treatment modality. In England, definitive chemoradiation has been used primarily for patients with localized disease that is unsuitable for surgery, Crosby said. Add-on therapy with cetuximab has improved outcomes in other cancers, notably head and neck cancer and colorectal cancer. The findings provided a rationale for evaluating the addition of cetuximab to primary radiation therapy for localized esophageal cancer. Crosby presented results of a randomized trial wherein patients with localized (stage I-III) esophageal cancer (less than 10 cm). Patients were excluded if they had celiac lymph-node involvement. The patients received cisplatin-capecitabine (Xeloda) chemotherapy with or without cetuximab. After 6 weeks of chemotherapy, patients underwent definitive conformal radiation therapy at a total dose of 50 Gy in 25 fractions. The trial had two stages. The first stage had a primary endpoint of treatment failure-free survival (TFFS), defined as alive at 6 months with no residual cancer in biopsy specimens and no evidence of disease progression outside the radiation therapy field. Secondary endpoints were toxicity, quality of life, overall survival (OS), and feasibility of recruitment. The first stage of the trial had an accrual target of 180 patients. The trial’s second stage had a primary endpoint of OS and accrual to 420 patients. However, the trial never reached second stage, but ended after a planned stage one analysis convinced the independent review committee that continued accrual to meet the primary endpoint would be futile. Treatment and follow-up continued with enrolled patients, and the final analysis included 258 patients who had completed the 6-month assessment of disease status. The analysis showed a marked difference in median OS between patients who met the TFFS goal at 6 months and those who did not: 26.7 months versus 8.3 months. Comparison of OS in the two arms yielded hazard ratio of 1.53 for the cetuximab arm versus chemoradiation only (P=0.035). In addition to the inferior outcomes with cetuximab, addition of the targeted agent added to the toxicity burden. The cetuximab arm had an 81.4% incidence of grade 3 to 5 toxicity compared with 72.9% without cetuximab. Patients who received cetuximab in addition to chemoradiation had significantly more grade 3 to 5 dermatologic toxicity (21.7% versus 3.9%, P<0.001) and metabolic/biochemical toxicity (24.0% versus 10.9%, P=0.005). Additionally, the analysis revealed a trend toward more cardiac adverse events in the cetuximab arm (6.2% versus 1.6%, P=0.053). The addition of cetuximab also adversely affected adherence to the treatment protocol. Patients in the cetuximab arm were significantly less likely to receive full doses of cisplatin (76.7% versus 89.9%, P=0.005), capecitabine (69.0% versus 85.3%, P=0.002), and radiation therapy (75.2% versus 86.0%, P=0.027). Additionally, almost a third of patients did not receive the prescribed dose of cetuximab. “Future strategies to improve the outcome of definitive chemoradiotherapy in esophageal cancer must focus on developing evidence-based biomarkers to select treatments and incorporating newer radiotherapy technologies and targeted systemic treatment to safely intensify treatment, including a higher radiotherapy dose,” Crosby said. Shutting down a specific pathway in cancer cells appears to improve the ability of common drugs to wipe those cells out, according to new research from scientists at Fox Chase Cancer Center (Cancer Discovery, January 2013, Vol. 3:1, pp. 96-111). The new approach appears to enhance the tumor-killing ability of a commonly prescribed class of drugs that includes cetuximab (Erbitux), used to treat head and neck cancers. These drugs work by blocking the activity of the epidermal growth factor receptor (EGFR), which sits on the cell surface and senses cues from the environment, telling cancer cells to grow and divide, according to co-author Igor Astsaturov, MD, PhD, an attending physician in the department of medical oncology at Fox Chase. In 2010, Dr. Astsaturov and his colleagues identified a pathway in the cell that, when blocked, completely suppressed EGFR activity. Interestingly, the pathway consists of a series of enzymes that, when working in concert, synthesize new molecules of cholesterol. Working with cancer cells in the lab, the researchers inactivated a key gene in the cholesterol synthesis pathway, and found the cells became more vulnerable to treatment with cetuximab. The same was true in mice that lacked this particular pathway, according to Dr. Astsaturov. The researchers then removed one of the cholesterol genes from the mouse genome and saw that mice developed patchy, scaly skin. When they biopsied this affected skin, they saw no activity of the EGFR protein, reaffirming that shutting down cholesterol synthesis interrupts EGFR. When the cholesterol biosynthesis pathway is blocked, the normal chain of events that creates a cholesterol molecule is interrupted, and cells accumulate intermediate products of cholesterol that block the normal movement of substances around the cell, according to the researchers. This cellular traffic jam makes it difficult for the cell to transport important components, such as EGFR, which has to move between the inside of the cell and its surface to function properly. Eventually, researchers can design drugs or look for existing ones that block this cholesterol synthesis pathway, Dr. Astsaturov noted. For now, his lab is trying to uncover more details of how the pathway works, the role of each protein that is involved, and whether if, by blocking a protein, they can wipe out tumors in humans that evade current therapies. The newly identified molecular pathway for cancers of the head and neck that involves the epidermal growth factor receptor (EGFR) led to developments of highly effective drugs specific for the cancerous cells, EGFR inhibitors. 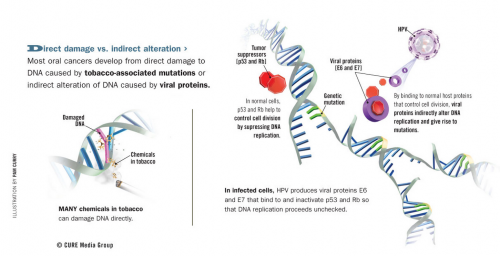 Soon afterwards, scientists discovered the increasingly important role that the human papillomavirus (HPV) played in the development of cancers in the head and neck. Following the explosion of research in the field of molecular pathways involved in head and neck cancers, doctors quickly found that the cancer was a lot more complicated than previous believed. Additional research continues as scientists try to make sense of the data. Approaching the treatment of head and neck cancer from their perspectives from surgery, radiology, and oncology, doctors on the panel discussed the difficulties the field currently faced. The director of Johns Hopkins’ Head and Neck Cancer Research department, oncologist David Sidransky, MD, opened the meeting. The chair of the conference was held by Ezra E.W. Cohen, MD, of The University of Chicago, who mentioned that the molecular differences involved in all the different kinds of this classification of cancer was quite challenging. “We are learning a lot more about the biology of this disease and are beginning to understand just how heterogeneous it is when it comes to molecular profiling, even within HPV-positive and HPV-negative tumors,” Dr. Cohen explained. As a board-certified surgeon, Robert L. Ferris, MD/PhD, from the University of Pittsburgh Cancer Institute, spoke on the importance of further development in immunotherapies. He stated that research in the use of monoclonal antibodies could hold the key to successful treatment, as so much of the cancer involved a key point of immune system dysfunction. With the successful development of targeted antibodies, doctors could learn how to turn off that immune reaction that makes cancers of the head and neck so difficult to treat. Similar to what Dr. Ferris said, treatment with monoclonal antibodies including cetuximab are one of the few glimmers of hope in the research, but results have been underwhelming so far. Quynh-Thu Le, MD, a radiologist at Stanford University, spoke about the current treatments in use. Radiation therapy has shown some success on its own, but she hopes to take it to the next level by involving the molecular therapies against EGFR. While studies have discussed evidence linking how aggressive head and neck cancers are by identifying low levels of oxygen in tumor sites, finding a solid mathematical relationship has been difficult. Dr. Le also outlined the lack of success that researchers have had in using secondary drugs such as bevacizumab to change blood vessels, theoretically increasing the amount of chemotherapy received by the tumors. “The thought was that if we could normalize tumor vasculature with antiangiogenic therapy, we could increase oxygen and chemotherapy delivery, thereby enhancing treatment in these tumors,” Dr. Le explained. Unfortunately, testing of the theory showed this was not the case. The presentation concluded with an appeal by Jill Gilbert, MD, an oncologist at the Vanderbilt Ingram Cancer Center requesting for more doctors currently practicing to become involved in front-line research, sending solid data back to research teams discussing what therapies had shown success. “This will require us [to] partner with physician–scientists in a broad array of arenas and [to] encourage patient participation and buy-in, because, without them, we are not going to see improvements in these areas,” stated Dr. Gilbert. 1. Material presented at the conference was given as expert-level evidence only rather than a presentation of data from a formal study. In their article, Chaturvedi et al1 document the rise in human papillomavirus (HPV) –associated cancers as a proportion of squamous cell carcinomas of the oropharynx over the last 25 years. The contemporary figures are mirrored by two recent British studies2,3 demonstrating that the majority of oropharyngeal cancers are now HPV related. In the accompanying editorial,4 Mroz et al rightly highlight the importance of evaluating HPV vaccination for both men and women in the light of these data and lament the lack of significant improvement in the outcomes for non–HPV-associated head and neck cancers. However, they also suggest that the benefit of targeting epidermal growth factor receptor (EGFR) through concurrent cetuximab may be confined to HPV-associated tumors. Although EGFR expression per se does not correlate closely with response to cetuximab, there is increasing evidence of an inverse correlation between p16INK4A expression (as a marker of HPV association) and EGFR expression shown by immunohistochemistry.5,6 Though suppressed by viral oncogenes, HPV-associated tumors retain wild-type P53,7 and patients with this tumor type have demonstrated excellent survival with existing protocols such as concurrent chemoradiotherapy or surgery with postoperative radiotherapy. 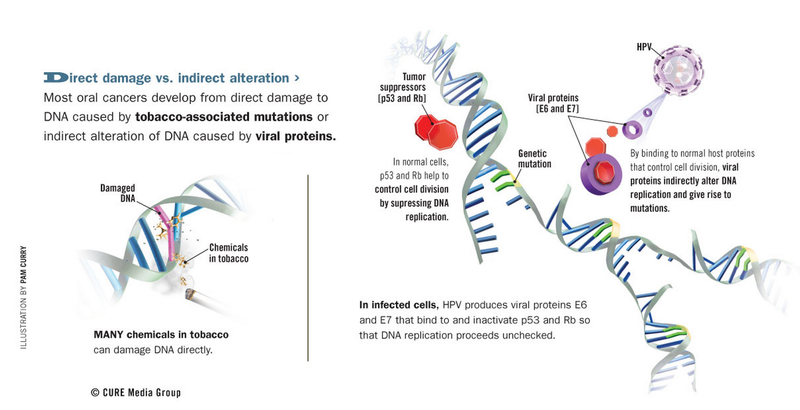 Conversely, non-HPV tumors, harboring a range of mutations,8 may respond less well to DNA-damaging agents, but patients with these tumors might benefit from the addition of concurrent EGFR blockade to radiotherapy. Data from the recent SPECTRUM (Study of Panitumumab Efficacy in Patients With Recurrent and/or Metastatic Head and Neck Cancer) study of adding another EGFR-targeting monoclonal antibody, panitumumab,9 suggest that in the metastatic setting at least, only patients with HPV-negative tumors benefit from a combination of palliative chemotherapy and an anti-EGFR strategy. If confirmed in sample sets containing non-HPV tumors treated with EGFR-targeting agents in combination with radiotherapy, this could open the door to the improvements urgently needed in HPV-negative oropharyngeal cancers, where an older demographic and greater burden of comorbidities make the uncomplicated and complete delivery of concurrent chemoradiotherapy challenging. Although all authors completed the disclosure declaration, the following author(s) indicated a financial or other interest that is relevant to the subject matter under consideration in this article. Certain relationships marked with a “U” are those for which no compensation was received; those relationships marked with a “C” were compensated. For a detailed description of the disclosure categories, or for more information about ASCO’s conflict of interest policy, please refer to the Author Disclosure Declaration and the Disclosures of Potential Conflicts of Interest section in Information for Contributors. A research study by Jeffrey Myers from the University of Texas MD Anderson Cancer Center and James Tour from the Rice University has reported that a combination of carbon nanoparticles and existing drugs has the capability to improve head-and-neck cancer treatment, particularly when coupled with radiation therapy. The novel technique encapsulates chemotherapeutic drugs using carbon nanoparticles, which sequester the drugs until their delivery into the targeted cancer cells, opening the door to develop customized therapies based on the requirements of individual patients. The researchers have developed a simple technique to mix Cetuximab, a targeting agent, and paclitaxel, a hydrophobic active chemotherapy agent marketed as Taxol, with hydrophilic carbon clusters that are functionalized with polyethylene glycol or PEG-HCC. According to the researchers, Cetuximab, paclitaxel and PEG-HCC ingredients combine easily and form a water-soluble compound that targets tumors more effectively than Taxol, while eliminating the toxic effects of Cremophor EL and paclitaxel on neighboring healthy cells. Cremophor EL is a carrier based on castor oil that makes the hydrophobic paclitaxel into a water-soluble compound and delivers it to patients intravenously. Tour commented that the novel technique utilizes a very small quantity of chemotherapy drug. Myers informed that tests involving the use of Cetuximab, paclitaxel and PEG-HCC ingredients and radiation therapy on mice demonstrated a substantial increase in destroying tumors. 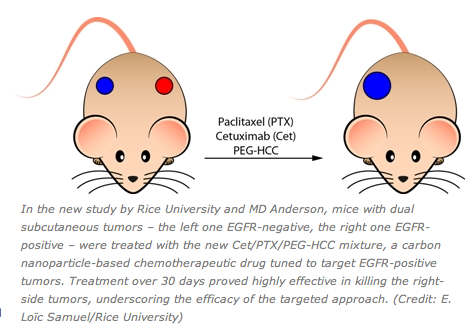 The researchers’ hypothesis is paclitaxel detects the tumor cells to the radiation effects and Cetuximab and PEG-HCC augment the delivery of paclitaxel into the cancer cells, Myers explained. Tour stated that the functionalized carbon clusters are nontoxic. Myers commented that this research has demonstrated the principle that carbon nanoparticles are capable of linking a chemotherapeutic drug non-covalently with a targeting antibody, which can supply the drug to target-specific cancer cells. This principle can be applied for delivering other drugs to other kinds of cells via target-specific cell surface receptors as a way of augmenting the therapeutic ratio, Myers concluded. In Journal of Clinical Oncology, Tronconi et al1 report a fatal hypersensitivity reaction to cetuximab in a 63-year-old patient with metastatic colon cancer and outlined a 0.1% incidence of death in the literature. We greatly acknowledge the authors’ desire to communicate the risk of fatal anaphylactic reaction with cetuximab. Over the past 2 years in our center in Tours, France, four instances of grade 4 anaphylactic reactions occurred in patients treated for head and neck cancer (locally advanced or metastatic), with one immediately fatal; another patient died within 5 days (unpublished data). Seven lethal anaphylactic reactions were registered in a pharmacovigilance survey in France, based on spontaneous declarations (Grandvuillemin et al, manuscript in preparation). Anaphylaxis to cetuximab is a problem that merits serious clinical attention. In the Clinic provides overviews of novel oncology agents, addressing indications, mechanisms, administration recommendations, safety profiles, and other essential information needed for the appropriate clinical use of these drugs.Cetuximab (Erbitux) was recently approved by the FDA for use in combination with platinum-based therapy plus fluorouracil (5-FU) for the first-line treatment of patients with recurrent locoregional disease or metastatic squamous cell carcinoma of the head and neck.1-3 Cetuximab has prior indications in combination with radiation therapy in locally or regionally advanced squamous cell head and neck cancer and in recurrent or metastatic head and neck cancer that has progressed after platinum-based therapy. It also has indications in colorectal cancer. The most recent approval is based primarily on results of a study conducted outside the United States in 442 patients with metastatic or locally recurrent squamous cell carcinoma of the head and neck who were not suitable for curative treatment with surgery or radiation. The study used a European Union (EU)-approved cetuximab rather than the U.S.-approved cetuximab (Erbitux). Erbitux provides approximately 22% higher exposure than the EU-approved cetuximab; these pharmacokinetic data, together with the results of the study conducted in Europe and other data using Erbitux establish the safety and efficacy of Erbitux at the recommended dose.In this trial, the addition of cetuximab (n = 222) to platinum-based therapy plus 5-FU (n = 220) significantly increased median overall survival from 7.4 to 10.1 months, representing a 20% reduction in risk of death (HR = 0.80, P = .034), and significantly increased median progression-free survival from 3.3 to 5.5 months, representing a 43% reduction in risk of disease progression (HR = 0.57, P < .0001). Objective response rates were 35.6% in the cetuximab group and 19.5% in the chemotherapy-alone group (P = .0001). Cetuximab is an IgG1 monoclonal antibody that inhibits ligand-binding to the epidermal growth factor receptor (EGFR) on both normal and tumor cells. 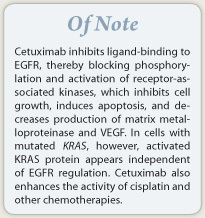 Binding of cetuximab to EGFR blocks phosphorylation and activation of receptor-associated kinases, resulting in inhibition of cell growth, induction of apoptosis, and decreased production of matrix metalloproteinase and vascular endothelial growth factor. In cells with activating KRAS mutation, however, the KRAS proteins are continuously active and are independent of EGFR regulation. Cetuximab also stimulates antibody-dependent cell-mediated cytotoxicity and enhances the activity of a number of chemotherapeutic agents, including cisplatin. For the new indication, the recommended dose is 400 mg/m2 as a 120-minute IV infusion, with a maximum rate of 10 mg/min, on the day that platinum-based therapy plus 5-FU is started. The infusion must be completed 1 hour prior to beginning platinum-based therapy plus 5-FU. The subsequent weekly dose is 250 mg/m2 over 60 minutes until disease progression or unacceptable toxicity.Patients should be premedicated with an H1 antagonist (eg, diphenhydramine, 50 mg) IV 30 to 60 minutes before the first dose of cetuximab; premedication for subsequent doses depends on clinical judgment and presence/severity of prior infusion reactions. The infusion rate should be reduced by 50% for grade 1 or 2 or nonserious grade 3 infusion reactions. Cetuximab should be immediately and permanently discontinued for severe infusion reactions.In cases of severe acneiform rash, administration should be delayed by 1 to 2 weeks, and cetuximab discontinued at the fourth occurrence. The weekly dose should be reduced to 200 mg/m2 after the second occurrence and 150 mg/m2 after the third.Cetuximab should be administered via infusion pump or syringe pump and through a low protein-binding 0.22-micrometer in-line filter. Cetuximab carries a boxed warning for infusion reactions and cardiopulmonary arrest. Serious infusion reactions occurred in approximately 3% of patients in clinical trials, with fatal outcome in less than 1 in 1,000 cases. In patients with squamous cell carcinoma of the head and neck receiving cetuximab, cardiopulmonary arrest or sudden death occurred in 2% of those receiving radiotherapy and in 3% of those receving platinum-based therapy plus 5-FU. Serum electrolytes, including magnesium, potassium, and calcium, must be carefully monitored during and after cetuximab administration.In the trial supporting the current indication, the most common adverse reactions (≥ 25%) in patients in the cetuximab group were nausea, anemia, vomiting, neutropenia, rash, asthenia, diarrhea, and anorexia; conjunctivitis occurred in 10%. Other adverse reactions, sometimes severe, caused by cetuximab included infusion reactions, hypomagnesemia, hypocalcemia, and hypokalemia. Death attributed to cardiovascular event or sudden death was reported in 3.2% of the patients in the cetuximab group and in 1.9% in the chemotherapy alone group. The Food and Drug Administration on Nov. 7 approved cetuximab as an initial treatment of late-stage head and neck cancer in combination with chemotherapy. Cetuximab, marketed as Erbitux by Bristol-Myers Squibb, is an epidermal growth factor receptor (EGFR) antagonist, administered as an intravenous infusion. Previously, it was approved in combination with radiation therapy for the initial treatment of locally or regionally advanced squamous cell carcinoma. It was also approved for use alone in patients with recurrent locoregional disease or metastatic disease whose disease has progressed following platinum-based chemotherapy. Erbitux was initially approved in 2004 to treat EGFR-positive late-stage colon cancer after patients stopped responding to chemotherapy and was approved in 2006 for the treatment of head and neck cancer. The newly approved indication is for “recurrent locoregional disease or metastatic squamous cell carcinoma of the head and neck in combination with platinum-based therapy with 5-FU,” according to the revised label, posted on the FDA Web site. The two previously approved indications for head and neck cancer were for “locally or regionally advanced squamous cell carcinoma of the head and neck in combination with radiation therapy,” and for “recurrent or metastatic squamous cell carcinoma of the head and neck progressing after platinum-based therapy. “Erbitux’s ability to extend the lives of patients with head and neck cancers is an important tool for oncologists who often rely on a multitreatment approach for patients,” Dr. Richard Pazdur, director of the Office of Hematology and Oncology Products in the FDA’s Center for Drug Evaluation and Research said in the statement. “Given the aggressive nature of head and neck cancers that cannot be treated with surgery and radiation, it is important that patients have as many treatment options available as possible,” he added. The approval was based on a multicenter study of 442 patients who had metastatic or recurrent head and neck cancer, which was inoperable or widespread, and of those who had not been treated with chemotherapy. The study was conducted outside of the United States and used a version of cetuximab that is not approved in the United States, the statement said. The median overall survival among patients who were treated with cetuximab and chemotherapy (cisplatin or carboplatin and 5-fluorouracil) combination was 10.1 months, compared with 7.4 months among those who received chemotherapy alone cisplatin or carboplatin and 5-fluorouracil, the FDA statement said. The most common adverse events reported by patients in the cetuximab plus chemotherapy arm were rash; pruritus; nail changes; headache; diarrhea; and respiratory, skin, and mouth infections, according to the FDA. Other adverse effects that have been associated with cetuximab include low serum levels of magnesium, potassium, and calcium; and potentially fatal infusion reactions and myocardial infarctions. Sun exposure should be limited during treatment. Cetuximab available in the United States provides about 22% greater exposure than the European Union–approved cetuximab that was used in this study, but this pharmacokinetic data along with the results of this study “and other clinical trial data establish the efficacy of Erbitux at the recommended dose,” according to the revised prescribing information posted on the FDA Web site. The US Food and Drug Administration (FDA) has approved Erbitux (cetuximab), in combination with platinum-based chemotherapy with 5-fluorouracil (CT), for the first-line treatment of recurrent locoregional or metastatic squamous cell carcinoma of the head and neck (SCCHN). The approval, which is based on data from the landmark EXTREME (ErbituX in first-line Treatment of REcurrent or MEtastatic head & neck cancer) trial, makes Erbitux plus CT the first treatment regimen approved in 30 years with extended overall survival in patients with recurrent locoregional or metastatic SCCHN. Erbitux (cetuximab) is a monoclonal antibody (IgG1 Mab) designed to inhibit the function of a molecular structure expressed on the surface of normal and tumour cells called the epidermal growth factor receptor (EGFR, HER1, c-ErbB-1). In vitro assays and in vivo animal studies have shown that binding of ERBITU Erbitux GFR blocks phosphorylation and activation of receptor-associated kinases, resulting in induction of apoptosis (cell death), inhibition of cell growth, and decreased matrix metalloproteinase and vascular endothelial growth factor production. In vitro, Erbitux can mediate antibody-dependent cellular cytotoxicity (ADCC) against certain human tumor types. In vitro assays and in vivo animal studies have shown that Erbitux inhibits the growth and survival of tumour cells that express the EGFR. No anti-tumour effects of Erbitux were observed in human tumour xenografts lacking EGFR expression. EXTREME, which was previously published in the New England Journal of Medicine, was a phase III open label, randomized, multi-centre, controlled trial. This study was conducted outside the US by Merck KGaA, Darmstadt, Germany, and used European Union (EU)-approved cetuximab. Erbitux provides approximately 22% higher exposure relative to the EU-approved cetuximab used in the EXTREME trial; these pharmacokinetic data, together with the results of the EXTREME trial and other clinical trial data establish the efficacy of Erbitux at the recommended dose. EXTREME showed that cetuximab plus CT in the first-line treatment of recurrent locoregional or metastatic SCCHN resulted in superior efficacy across clinically meaningful endpoints, including overall survival, progression-free survival, and objective response rate compared to CT. Cetuximab plus CT significantly extended patients’ median overall survival by 36% compared to patients who received CT alone (10.1 months vs. 7.4 months, respectively) [HR: 0.80; 95% CI: 0.64-0.98; p=0.034]. Cetuximab plus CT also significantly increased median progression-free survival by 67% (5.5 vs. 3.3 months, respectively) [HR: 0.57; 95% CI: 0.46-0.72; p<0.0001] compared to CT alone. A significant improvement in objective response rate was also demonstrated (36% vs. 20%, odds ratio, 2.33 [95% CI: 1.50-3.60]; p=0.0001). Serious infusion reactions occurred with the administration of Erbitux in approximately 3 per cent of patients in clinical trials, with fatal outcome reported in less than 1 in 1000. Healthcare providers should immediately interrupt and permanently discontinue Erbitux infusion for serious infusion reactions. Cardiopulmonary arrest and/or sudden death occurred in 2 per cent of patients with squamous cell carcinoma of the head and neck treated in a clinical trial with Erbitux and radiation therapy and in 3 per cent of patients with squamous cell carcinoma of the head and neck treated with EU-approved cetuximab in combination with platinum-based therapy with 5-fluorouracil (5-FU) in the EXTREME trial. Healthcare providers should closely monitor serum electrolytes, including serum magnesium, potassium, and calcium, during and after Erbitux administration. Bristol-Myers Squibb and Lilly are committed to supporting patient access to ERBITUX and have put in place a number of programmes to help patients and providers. Destination Access, which is a Reimbursement Support Program, helps patient access by providing benefits investigation support, prior authorization assistance, appeals assistance and patient assistance.